The B326HUL isn't particularly flashy, but it's attractive nonetheless. The enormous 25-pound cabinet has thin (0.4-inch) bezels on the top and sides and a slightly wider (0.7-inch) bottom bezel that holds five function buttons and a Power switch. It is supported by a large rectangular base and arm assembly that gives you just under 6 inches of height adjustability, and the monitor can also tilt and swivel. VESA-compliant mounting holes are available should you decide to hang the display on a wall. The panel's matte, non-reflective coating does a good job of reducing glare. 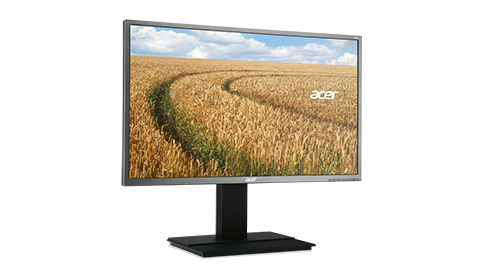 As with the Acer K272HUL$399.99 at Amazon, the B326HUL uses on-screen labeling to let you know which buttons to press while navigating the On-Screen Display (OSD) menus. Picture presets include Eco, Standard, Graphics, Movie, and User-Defined modes. In addition to Brightness, Contrast, Gamma, and Color Temperature settings, there are 6-Axis Hue and 6-Axis Saturate settings that let you fine-tune color levels, and an Adaptive Contrast Management (ACM) setting that adjusts the monitor's contrast according to what's being displayed on the screen. I'd suggest leaving ACM disabled, as it tends to make the picture much too bright. The B326HUL used 48 watts of power during testing while set to the Standard mode. In Eco mode, power consumption dropped to an impressive 29 watts without too much dimming. The Dell UP3214Q$2,149.99 at Dell averaged 88 watts of power in Standard mode, and the Asus PQ321$2,231.00 at Amazon used 72 watts.